Zoysiagrass (Zoysia spp.) 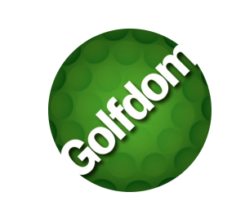 is on about 25,000 acres of golf course turf in the United States. 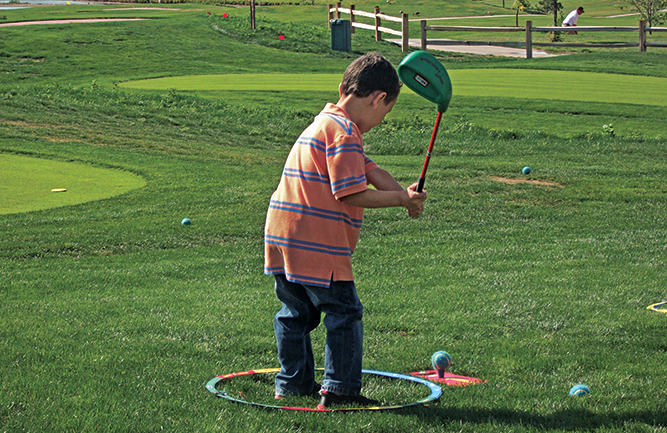 It provides golfers with an excellent ball lie when used in fairways, and its wear and divot tolerance, low nutritional requirement and tolerance to abiotic stresses makes it cost effective to maintain. Several newer cultivars have entered the marketplace in the past 30 years and are used in the Southeast, but Meyer zoysiagrass (Zoysia japonica Steud.) is the most common cultivar used in the Transition Zone. Most zoysiagrass cultivars produce seedheads (inflorescences) in the spring and fall under short-day conditions, while others, such as Meyer zoysiagrass, only produce seedheads in spring. Zoysiagrass seedheads are tough and fibrous, making them tough to cut cleanly, causing excess wear on mowing equipment and increased equipment technician labor costs. Further, zoysiagrass fairways look less than ideal during seedhead production. 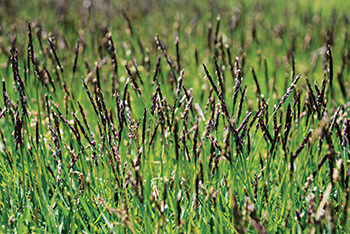 Meyer zoysiagrass appears dark purple-colored before mowing (Figures 1 and 2) because of pigments in the seedhead, and white-colored after mowing because of shredded seed stems (Figures 3 and 4). Previous research on zoysiagrass seedhead suppression with plant growth regulators or herbicides has yielded few effective or safe solutions. Spring applications of certain herbicides effectively suppress zoysiagrass seedheads, but not without causing unacceptable injury. Ethephon, a plant growth regulator, is known to inhibit seedhead production by releasing ethylene. 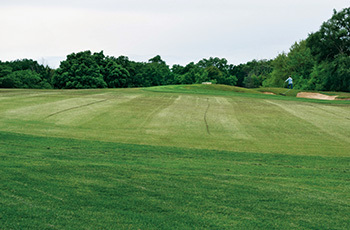 Two spring applications of Proxy (ethephon from Bayer) provided 60 percent to 89 percent Meyer zoysiagrass seedhead suppression with little zoysiagrass injury in Indiana and Tennessee research, but two applications of Proxy to achieve 60-percent or greater seedhead production would be cost and labor prohibitive for most golf courses. 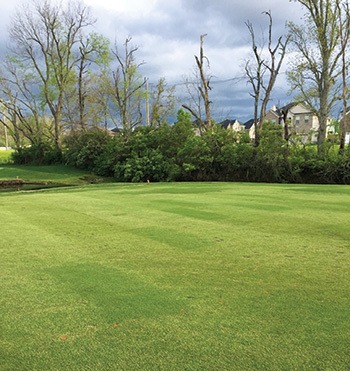 Recent research on annual bluegrass (Poa annua) management discovered that superintendents could improve conventional spring Proxy application programs by adding a late winter application. The researcher hypothesized that annual bluegrass seedhead initiation begins in winter prior to conventional early spring Proxy applications. Similarly, our hypothesis was that we could suppress zoysiagrass seedheads if we applied Proxy in the fall prior to winter dormancy. 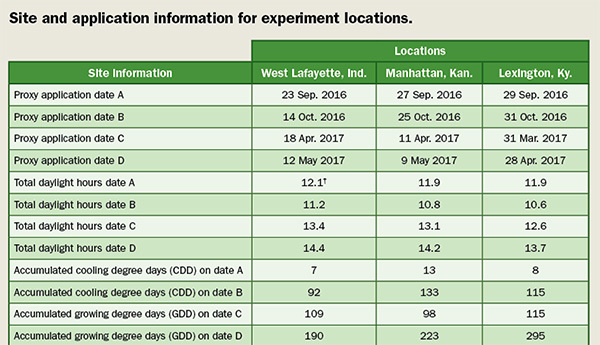 We conducted experiments in 2016-2017 in West Lafayette, Ind. at Purdue University, Manhattan, Kan. at Kansas State University and in Lexington, Ky. at the Southeastern Turfgrass Research Center in Lexington. Each site maintained a mature Meyer zoysiagrass fairway area with a cutting height of 0.5 inch to 0.625 inch. Onsite weather stations monitored the soil and air temperatures in degrees Celsius. We calculated cooling degree days (CDD) daily starting on Aug. 1 as Tbase − [(Tmax + Tmin) / 2] = CDD using onsite weather stations. In this equation, Tmax is the daily maximum air temperature, Tmin is the daily minimum air temperature, and Tbase is the lowest temperature in which plant growth occurs. We calculated cooling degree days in late summer and fall using 20 degrees C as Tbase because little zoysiagrass growth occurs below this temperature. Negative CDD values were set to zero prior to summing their accumulation. We treated plots with Proxy plant growth regulator at 5 fl. oz./1,000 ft2 at one of four different initial application timings. 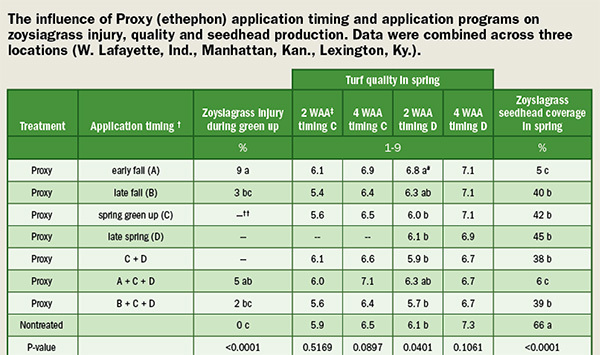 The four initial Proxy application timings we tested were (A) early fall application to 100-percent green turf concurrent with when large patch fungicides are recommended, (B) 28 days after the early-fall application A, (C) spring application at 50-percent zoysiagrass green up and (D) 28 days after the spring application C when the turf was 99 percent or more green (Table 1). Additionally, three different sequential application timings were evaluated that included timings C+D, A+C+D, and B+C+D. We included a nontreated control plot for comparison, and eight treatments were evaluated in total. We applied the treatments at spray volumes of 1 gal./1,000 ft2 in Kansas and 2 gal./1,000 ft2 in Indiana and Kentucky. While all application timings of Proxy suppressed zoysiagrass seedheads compared with the nontreated plots, the early fall application timing was the only timing to provide acceptable levels of suppression (Table 2, Figure 5). Averaged over all three locations, seedhead coverage in plots treated with Proxy in early fall was 5 percent to 6 percent, a greater than 90-percent decrease from nontreated plots (Table 2). Suppression of Meyer zoysiagrass seedheads by an early fall (timing A) application of Proxy was not enhanced by follow-up applications in spring (timings A+C+D). Additionally, late fall applications of Proxy (timing B) 28 days after early fall (timing A) applications only marginally reduced seedheads, indicating that there is a narrow application window for best results (Table 2). Minor zoysiagrass injury was present in spring from the early fall (timing A) application and noticeable during green up as yellowing turf. However, we noted only 5-percent to 9-percent injury. No injury from any treatment was visible in the fall before winter dormancy. 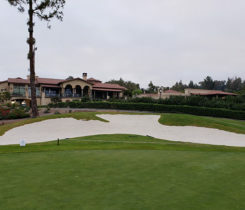 Additionally, there was no visible injury from any treatment after spring green up. This short-lived and minor injury on zoysiagrass is consistent with previous reports and consistent with findings that zoysiagrass is among the turfgrass species least injured by ethephon. Turf quality largely was unaffected by the treatments, although quality was improved after green up in some plots because of reduced seedheads and subsequently improved mowing quality (Figure 6). Some grasses, especially those adapted to high altitudes or latitudes, are capable of initiating inflorescence development in the fall, with inflorescences emerging after winter. Meyer zoysiagrass is adapted to cold winters and was selected from high latitude, while many other zoysiagrass cultivars used in the Southeast are less winter hardy and were collected from lower latitudes. We theorize that Meyer zoysiagrasses’ flowering induction requirements are met by decreasing daylength and temperature in autumn and winter (vernalization), while secondary induction requirements of increasing daylength and temperature are met in spring. Other zoysiagrass cultivars such as Diamond [Zoysia matrella (L.) Merr.] that have both spring and fall seedhead flushes and a subtropical origin may lack a vernalization requirement for floral induction. Prediction models for seedhead emergence currently are imperfect, but zoysiagrass seedhead emergence is correlated to growing degree days, day length and calendar date. The early fall application timing that successfully suppressed Meyer zoysiagrass seedheads in our experiment was applied under these conditions: 1) application dates of Sept. 23 to Sept. 29 to 100-percent green zoysiagrass; 2) daylength of 11.9 hours to 12.1 hours; and 3) accumulated cooling degree days less than 14 (20 degrees C base temperature). We theorize the application window for effective Meyer zoysiagrass seedhead suppression is wider than these specific data reflect, and we have started additional experiments to refine this fall application window. Much of the research on the timing of plant growth regulator applications is based on the accumulation of GDD. This is the first attempt to relate zoysiagrass development to cooling degree days, but it may be a useful metric as cooling temperatures are necessary for floral induction. The timing of effective Proxy applications to zoysiagrass also corresponds with the recommended application timing for the treatment of large patch disease (Rhizoctonia solani) in the Transition Zone. Research done in 2017 recommended applying large patch fungicides when a seven-day average of thatch temperatures cooled to 64.0 degrees F to 73.8 degrees F in fall. Thatch temperature data were not recorded in our study, but soil temperature averages at a 4-inch depth ranged from 69.8 degrees F to 73.2 degrees F for the seven days prior to application (timing A) at our locations. We recommend tank-mixtures of Proxy and fungicides for large patch control to reduce application labor and equipment costs. However, applicators should use a jar test to test for compatibility when adding other products to the mixture. Further, avoid applications before heavy rainfall is anticipated. Rain reduces efficacy. 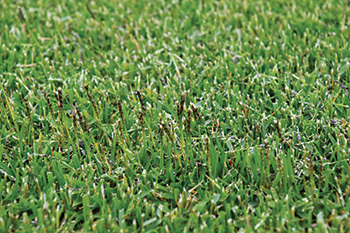 This research provides turf managers with insight on how to suppress Meyer zoysiagrass seedhead production. 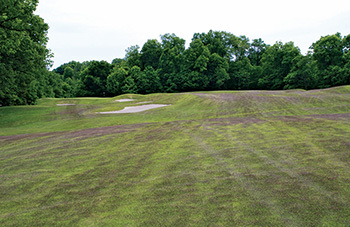 Proxy applications were effective when applied in early fall about one month prior to winter dormancy and six months prior to peak zoysiagrass seedhead production. These findings on Proxy application timing should apply to the majority of the Transition Zone. However, we need more research and practical experience to help refine recommendations for zoysiagrass seedhead suppression. † (A) early fall application to 100-percent green turf concurrent with when large-patch fungicides are applied, (B) 28 days after the early fall application A, (C) spring application when 50-percent zoysiagrass green up occurred, and (D) 28 days after the spring application C when the turf was 99 percent or more green (Table 1). # Within columns, means followed by the same letter are not significantly different (α=0.05). †† Treatments not yet applied on this rating date and were excluded from analysis. Thanks to Bayer Environmental Science for supporting this research. Aaron Patton, Ph.D., is a turfgrass scientist at Purdue University, Jared Hoyle, Ph.D., is a turfgrass scientist at Kansas State University, Mike Harrell, Ph.D., is a turfgrass scientist at the Southeastern Turfgrass Research Center and Zac Reicher, Ph.D., is a turfgrass scientist with Bayer CropScience. You may reach Aaron Patton at ajpatton@purdue.edu for more information. 1. Askew, S.D. 2017. Plant growth regulators applied in winter improve annual bluegrass (Poa annua) seedhead suppression on golf greens. Weed Technol. 31:701-713. 2. Brosnan, J.T., G.K. Breeden, M.T. Elmore, A.J. Patton, and D.V. Weisenberger. 2012. Zoysiagrass seedhead suppression with imidazolinone herbicides. Weed Technol. 26:708-713. 5. Heide, O.M. 1994. Control of flowering and reproduction in temperate grasses. New Phytologist 128:347-362. 7. Latting, J. 1972. Differentiation in the grass inflorescence. In: Youngner, V.B., McKell, C.M. (eds.) The biology and utilization of grasses. New York: Academic Press. pp. 365–399. 8. McCullough, P.E., J. Yu, and S.M. Williams. 2017. Seedhead development of three warm-season turfgrasses as influenced by growing degree days, photoperiod, and maintenance regimens. Internat. Turfgrass Soc. Res. J. 13(1):321-329. 9. Obasa, K., J. Fry, D. Bremer, and M. Kennelly. 2017. 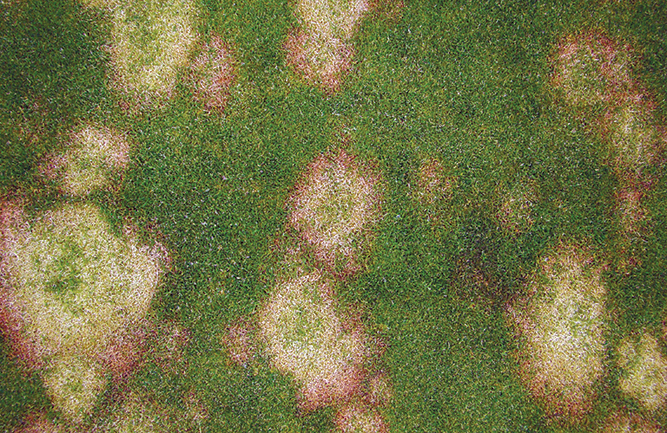 Evaluation of spring and fall fungicide applications for large patch management in zoysiagrass. Internat. Turfgrass Soc. Res. J. 13:191-197. 11. Sidhu, S.S., J. Yu, and P.E. McCullough. 2014. Physiological behavior of ethephon in five turfgrasses. Crop Sci. 54:1816-1822.